I’ve never been a fan of the default avatars available for WordPress from Gravatar. You’d think Gravatar would offer you an option in your account to point to a custom default for those leaving a comment on your blog. Since that isn’t the case I went looking for a WP plugin,and found this nifty option to install in your wp-content/plugins directory. Now I can create custom avatars,and give those leaving a comment the option of choosing one. Granted it’s all my artwork,but it sure beats the bland quilt square,boring mystery man or (not scary) monster avatars. For the moment,my custom avatar choices are limited,but size matters,so comment away. 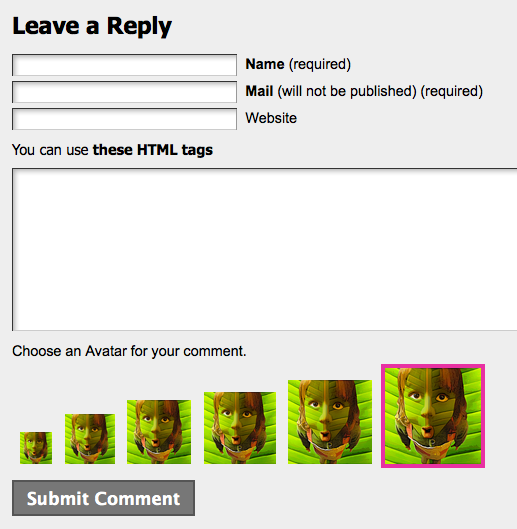 The name of the plugin is Custom Avatars for Comments created by Nicolas Kuttler. 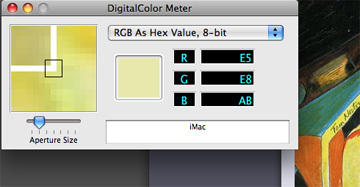 On a Mac,there’s a little-known utility that’s installed by default called “Digital Color Meter”,which will show you the current color (in hex,or an RGB tuple) of anything on the screen under the mouse cursor. 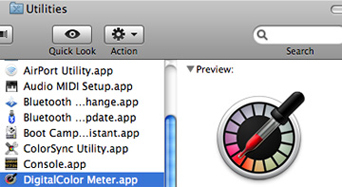 A nice built-in option for anyone using OS X in addition to the fabulous FF add-on Colorzilla. In the second screen shot,you’ll see the value of Red,Green and Blue for the light yellow swatch I had the cursor hovering over. Just combine each of the three numbers to get your six digit Hex number. No need to dig around in the CSS or HTML on a page to find the number value of a color you like,and may want to test out in your own digital design.